In Adelaide we have pigs in the mall. They have lovely shinny heads and backs where people have patted them. My, this porker looks very happy I think some of the people have been feeding him, what do you think? I tried to tell him he will get a tummy ache, like I did at Easter if he ate toooo much. I think he listened to me because he walked away. Every one loves our pigs that are in the center of our city's shopping mall. They are sculptures that depict the symbol of home, that were made for the Centenary of Federation. Oh Granny I really feel like I might slip off. In our park lands there are about 22 or 23 of these mounds. They look quite good among the gum trees. It was a busy day going into town, I am worn out and I am just hangin out for Toast, honey and peanut butter for supper. At least I don't eat like those pigs. Welcome to a new follower Corina. to help us past the short term obstacles." Wow, what a special and exciting day you and Granny had. We love your piggy friend, I love piggies. Be careful sitting on that sculpture, it looks like it would make an exciting slide though. The spring flowers are so bee-u-tee-ful. И замечательная увлекательная прогулка - свинки - прелесть! Excellent new friends, we hope they shared some of their bounty, although perhaps not the rubbish... We were kind of disappointed those weren't beehives too, it looked time for a little something! As for spring, don't tease us, it's still not showed up here! How wonderful to have such lovely piggies to visit when going to the mall. You and Granny have so many fun adventures and see so many wonderful things. Spring is finally coming and soon we will have beautiful flowers like the ones in the photo and not long after that we will be going to camp. See you there. Looks like you had a fun day out and love the piggy sculptures and the hyacinths are so pretty. deve essere stato bellissimo vedere tanti maiali. Wilbur sei stato bravo ? I like pigs and what a very nice bear. I think you both had a lovely day at the mall!!!! I was just thinking Wilbur if I had been in the mall and seen you at the pigs I would have recognised you and said Hello! I often walk by there and smile at those cheeky porkers .... my favourite is "Truffles"
I like pigs. The hyacinths are beautiful. I love those pigs! I want them for my courtyard! ;-) If I was a teenager I had a pig on the farm of my first boyfriends parents (I was 16 it is a loooong time ago) I have raised this pig with the bottle, because his mother don´t feed him, and he was trusty like a dog someday. He always sit and lok at me like this one on the second of your photos and than I have to scratch him between hin ears.. He was so cute! *sigh* Thank you, your photos make me remebering in happy good old times! Those hyacinths are lovely and you know pigs are one of my favourite animals. Glad you didn't slide right off that beehive Wilbur! Looks like you both had a lovely time!!! 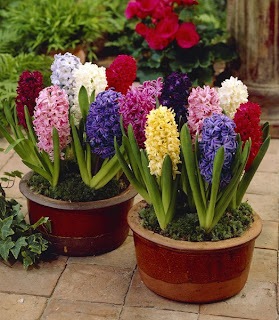 I adore the pigs and the beehives are amazing......love the hyacinths, one of my most favourite flower!!!! Beautiful pigs !!! and beautifuls flowers !!!! Have a lovely weel Kay !! I can't believe I missed your blog post last week, especially given the subject of PIGS!!! I'm making a pig at the moment, so I should have come with you to see the pigs in the mall - it would have given me inspiration. Granny takes you to such interesting places, Wilbur - you are a fortunate bear indeed! Oh Wilbur! You and Granny must have had an audience when you were getting your picture taken. Wish I had been there to watch..especially in some of your situations!